The biopharmaceutical industry has experienced an exponential growth in the number of site-directed drugs. These specifically targeted drugs are effective at lower doses and minimise or eliminate side effects. Site directed delivery of DNA or RNA therapeutics often relies on nanoparticles to deliver their payload. Delivery to the cell nucleus typically involves the use of a solid lipid nanoparticle (SLN). The components of these lipid nanoparticles are critical to their effectiveness. The analysis of nanoparticles is challenging as many of the components cannot be detected by traditional HPLC-UV. Eurofins Advantar scientists develop HPLC methods that employ a sensitive charged aerosol detector (CAD) to quantify these non-chromophoric components. For example, scientists use UHPLC-CAD method to measure multiple lipids and their degradation products (lyso-PC and free fatty acids) to support the analysis of a client’s lipid nanoparticle drug product. 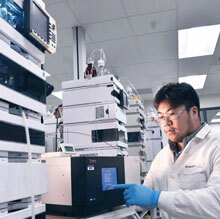 The useful application of HPLC-CAD goes well beyond the analysis of nanoparticles. Many antibiotics (gentamicin, streptomycin, tobramycin), including the broad spectrum anti-MRSA antibiotics in development cannot be measured by UV, but are perfect candidates for HPLC-CAD analysis. For example, Eurofins Advantar manufactures and tests a topical antibiotic cream, paromomycin, for the US Army. This antibiotic cannot be measured by UV. Scientists have optimised and validated HPLC-CAD assays for the analysis of potency and purity in this drug product. Carbohydrates in many drug products such as mannitol, sucrose and carboxymethyl cellulose can now be measured by HPLC-CAD. Polymers such as polyethylene glycol and dextrans are easily measured by HPLC-CAD. Even counter ions in drug products, such as sodium and potassium, can be measured by HPLC-CAD.